She got me thinking about my travel style and after pondering deeply, or drinking wine (I forget which, but then, whenever I drink wine, I always think that I am pondering deeply) I came to the profound realization that I am indeed both. In addition to places noble and noteworthy, I have been known to seek out the tackiest, cheesiest tourist traps (as proven during Greg’s and my cross-country odyssey this past summer) with unbounded enthusiasm, loving every minute of it. Whenever I contemplate leaving any of the lower 48 however, I go into “traveler” mode. That is the essence of my Phase One: learning as much as I can about the country’s people, history, culture before I leave home. Not only does it make the experience more enjoyable, but it also makes my trips feel like they last longer. One of the many reasons I love traveling with Road Scholar is that in addition to the trip lectures, the pre trip materials always include a suggested reading list. Additionally, their website now offers “social networking” features, such as trip blogs from prior participants. As I type this, my new virtual buddy, Nancy from Canada, is on the “Journey Into the Heart of Asia”, so traveling along with her, gives me a sneak preview! So, in the spirit of doing likewise for those future Road Scholar Asian Adventurers, I will attempt to be as helpful in my posts. For starters, here is my opinion of some of the books on the reading list. I didn’t buy any of them–fortunately I have access to an amazing library system here in New Jersey. (Okay, so we do have high taxes, but we also have access to fantastic services). Mike and I will have some time in Thailand before the Road Scholar tour begins so although it was not on the list, I’m reading “The Bridge Over the River Kwai” just in case we decide to visit Kanchanaburi. The Insight Guides (already back in the library) are a wonderful starting point, and provide a very useful overview of the countries we will be visiting. 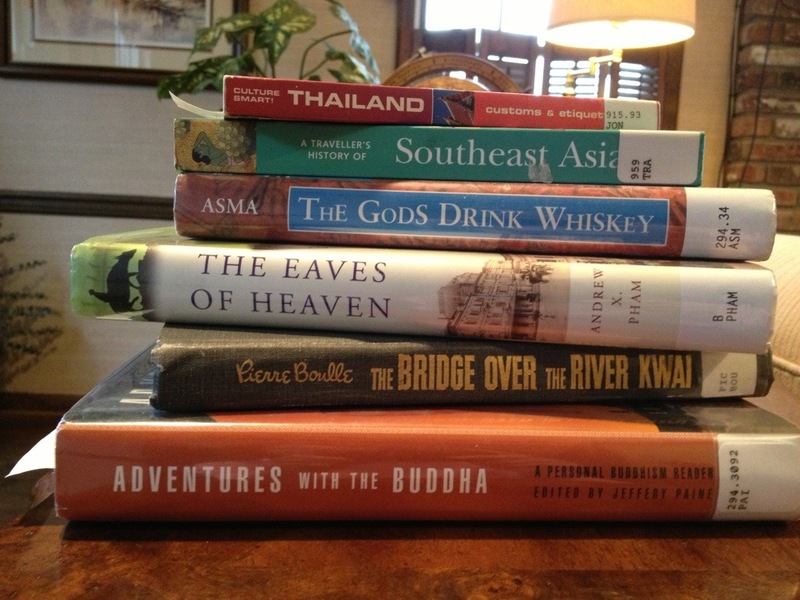 I have finished “Culture Smart Thailand”, “The Gods Drink Whiskey”, and “A Traveller’s History of Southeast Asia”. If I only had time to read one, I’d pick The “Gods Drink Whiskey”. I won’t even attempt to do a review of the book–why bother, because I could never improve on what Mindy McAdams wrote. While meandering through the library stacks, I discovered four books about Vietnam that were not on the Road Scholar list and are worth mentioning. Graham Greene’s novel “The Quiet American”, set in Vietnam, in the early ’50s, during the war with the French, before American involvement. I also rented the movie, and as usual, found I much preferred the book. “The Sorrow of War” a novel by Bao Nihn, a north Vietnamese who was one of the 10 survivors out of 500 boys that fought in the Glorious 27th Youth Brigade during the “American” war, as it is known in Vietnam. I skimmed through sections of this book, which was quite sufficient to get a feel for what it was like for the typical young Vietnamese during and after the war. Two non-fiction books: “Seeing Vietnam” by Susan Brownmiller and “Vietnam Now” by David Lamb. Susan was on assignment for a travel magazine in 1992, which was when travel restrictions for Americans were lifted. David Lamb was first in South Vietnam as a journalist in 1968 then returned in 1997, to live for four years in Hanoi as a correspondent for the Los Angeles Times. I’ll be spending two weeks in Hanoi, working as a Global Volunteer in a Vietnamese school, so I figured it would be very helpful to gain additional insight into the country by reading a few post war narratives. So, three books and sixteen days to go. It feels like the best part of the college experience–the thrill of learning, with none of the pressures of exams! Sorry to disappoint you, if you thought I might be revealing some other college thrills. Hey, that was a long, long time ago! Istanbul is split between the continents of Asia and Europe. Unlike the Four Corners in the USA west, however, you can’t put a body part in each continent, because the Bosphorus River divides the city. Thailand is the only Southeast Asian country that was never ruled by a European power. True, all males in Thailand are encouraged to become monks for at least several months so that they can gain merit for their families. King Mongkut, also known as Rama lV was a monk from the age of 20 until he became king at age 47. By the time he died at age 64, he had accumulated 32 wives and 82 kids. Talk about making up for lost time! Thailand is the country formerly known as Siam, as in “The King and I ” fame, which by the way, was an unflattering and historically inaccurate portrayal of that very same King Mongkut mentioned earlier.